Coast Path Section 1 Minehead to Westward Ho! South West Coast Path 1 – Minehead to Westward Ho! Discover challenging and dramatic walking trails shaped by the footsteps of traders, smugglers, saints and pirates. Cornish walking trails will reveal ancient tin mines, clifftop castles, timeless fishing villages and wild moors as you travel through a landscape of huge cliffs and hidden coves that goes back to the depths of time itself. In between the coastal drama, iconic harbours such as St Ives and Padstow give walkers access to some of the UK‘s best restaurants and coastal hotels. A county encircled by the wild Atlantic ocean, there is over 330 miles of spectacular world class coast path here taking you around the farthest corners of England - put simply it feels like walking on the edge of the world. Stretching from coast to coast across the southwest of England, Devon is a richly diverse county with rugged shores and cliffs in the north, and classic Victorian seaside resorts in the south. In between you'll find tranquil green pastures, wooded gorges and the two dramatic wild moors in the National Parks of Dartmoor and Exmoor. Choose Devon for its walking variety, and you'll find that the popular image of cream teas and thatched cottages is true - but that Devon is so much more once you explore it on two feet. Coast to coast routes like the Two Moors Way will offer a journey through it all from the wild northern shores that inspired the Romantic poets to the maritime ports of the south coast. Free your soul and clear your mind! Walking on the wild moors of these National Parks is a wonderful antidote to modern living. England's last true wilderness, Dartmoor offers 365 square miles of virtually uninhabited freedom with high moors and twisted dramatic granite tors a land of myths, ghosts and legends. Exmoor, its smaller and more gentle neighour, is 250 Square miles of near perfect and unique beauty, with high uplands swathed in heather and steep, wooded gorges and rushing streams. See Dartmoor ponies and Exmoor stags in these wildlife rich areas, home to 30 species of mammals and over 240 types of bird. The moors offer a unique opportunity for more challenging walking where the only human sound you will hear is the rhythm of your own breath. Avoid the crowds and discover “Secret Somerset” missed by so many rushing headlong for the far South West. The 'land of the summer people' was named in a time when this area could only be visited in the summer months as the sea receded. Today its a rich, fertile and 'for real' landscape crowned by the fine walking ridges of the Mendip and Quantock Hills both protected areas of outstanding natural beauty. Rising up over King Arthur‘s Vale of Avalon along with the magical Tor at Glastonbury, walkers will find hidden gorges, wooded combes and the best inland panoramas of the South West. Also boasting its own Jurassic Coast Path, providing a gateway into the wilds of Exmoor National Park, Somerset offers walking routes without the crowds for those who want to find..... what the rest miss. Dorset has a comfortable old world “English” feel to it and its walking routes traverse a rather more green and agricultural land of thatched cottages, cream teas.... and fossils ! Walkers here will find the more gentle rolling farmland, pretty villages and chalk ridges beloved by Thomas Hardy that sweep down to end abruptly at the World Heritage Jurassic Coast. Here, alongside the sea, those after more challenging routes can take a walking holiday through time itself amongst the dramatic chalk stacks, cliffs and arches of the Dorsetshire fossil coast. An area that can be very busy in high season but often suits walkers looking for more gentle and less exposed walking than the far west of the region. Wales offers some of the best walking and outdoor activities to be had anywhere in the world. The 870-mile Welsh Coast Path was only fully opened in 2012 and is the world's first walk along the entire coast of a nation. 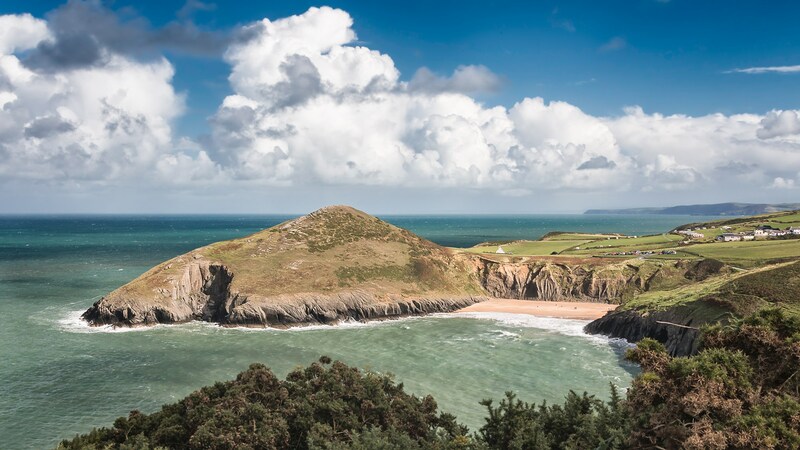 The terrain is on an equally grand scale with towering cliffs, vast stretches of unspoilt golden sands, imposing castles, offshore islands and to the north there is the backdrop of Snowdonia National Park with its stunning mountains. Wales in general offers walkers great value for money compared to more popular areas like Cornwall with walking options to suit everyone, from those who want the cosmopolitan restaurants and facilities of towns like Tenby and St Davids, through to isolated and remote forests and coastal hills that sit on the very cusp of the Snowdonian Peaks. Bursting with confidence and pride in its “Welshness”, its Celtic history, language and culture there has never been a better time for walkers to enter Wales. 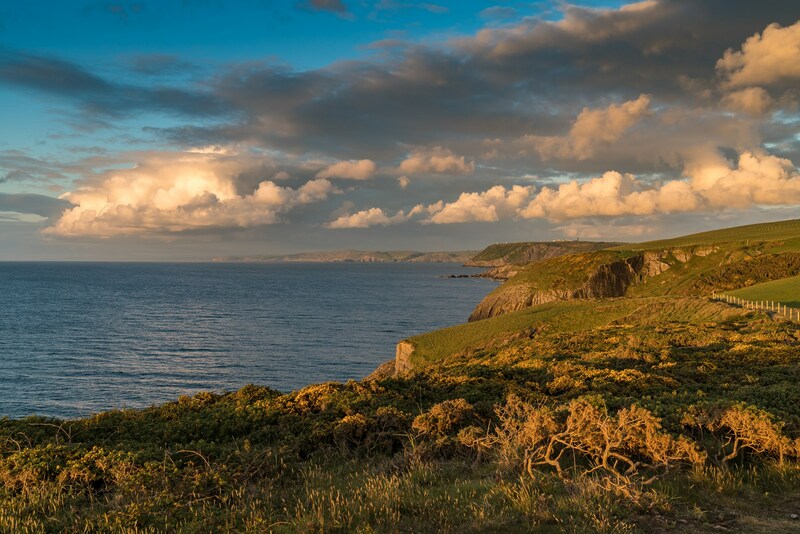 The South West Coast Path is the UK's longest National Trail and one of the top ten walking routes in the world. It snakes, dips and rises continuously on its way through a staggering 1014km (630 miles) of pristine coastline, 450 miles of which is through nationally protected areas. It's a challenge too; walking the entire South West Coast Path is the equivalent to scaling Mount Everest four times! From towering cliffs to hidden coves, ghostly tin mines to lush subtropical wooded creeks. One minute a dramatic rock theatre hewn out of the cliffs, the next a prehistoric fossilized forest or a 20thC Art Deco Island Hotel. 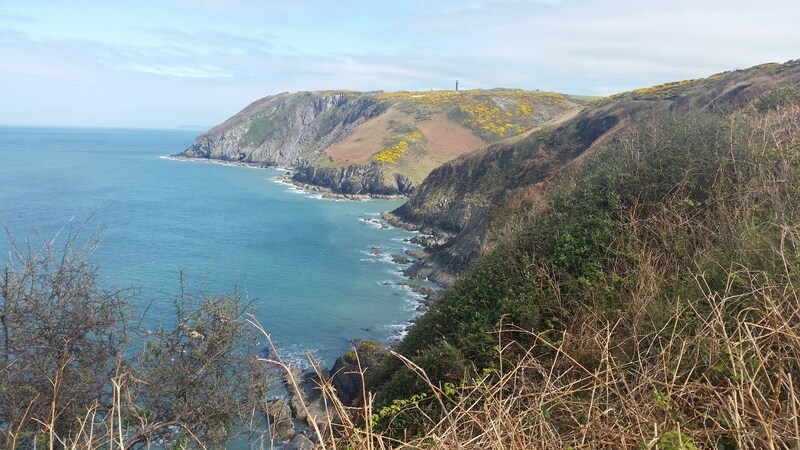 What sets The South West Coast Path apart from other trails is that around almost every corner is yet another surprise as you retrace the footsteps and histories of the tin miners, fisherman, smugglers, wreckers and the customs men who chased them. Above you, you can now see Pencribach is crowned by sinister towers and aerials – yes, the Ministry of Defence got here before you - in around 1940 to be precise. It is easy to see why they nabbed this headland, protected by a huge glacial valley on one side and by ocean and cliffs on the other. It’s a hush-hush place, set up as a Projectile Development Establishment, and deals with testing and development of drones, missiles and other secret high-flying weaponry. The upshot is that from Aberporth, you must divert inland for a mile around the headlands security fences and return to the path via the glacial valley, at Gwrddon. Once past the MOD site, the Valley is an immense jungle of gorse, blossom and stunted trees, hiding streams that rush to the sea far below. The lower level feels quite impenetrable, but the path pushes on through, leaving the Gwdrddon valley in its wake, as it transforms to classic, open coast path heading out to the promontory of Pen Peles. Snake your way along the coastline, in and out of little cwm valleys that drain into the sea, before returning to cliff-tops. The chasms are dense and deep with crashing waterfalls, while far below, grey seals haul out onto the rocky outcrops. Choughs, skylarks and yellowhammers can be seen in the skies while underfoot, depending on the time of year, you will find bluebells, scurvy grass and occasional marsh orchids. Ahead, the coastal mini-mountain at Mwnt dominates, and even from a distance you can see it’s a special place, perfectly conical, complete with narrow summit and scree and it seems to rise from the sea ahead of you. The name comes from a corruption of the English ‘mount’ referring to its pyramid peak. At the base you can drop down the end of an ice age glacial valley to a perfect little beach. Hemmed in by sheer, strata-layered rock, the place feels remote and hidden. The beach was the site of a bloody battle in 1155, when a failed invasion of Flemish soldiers was defeated by local people. The Bloody Sunday of Mwnt was commemorated by a festival in this lonely windswept spot every year, right up until the 18th century. Mwnt beach is a beautifully isolated cove, windswept, golden and beautifully untouched. Watch out in the waters here for occasional visits by bottlenose dolphins and harbour porpoise. 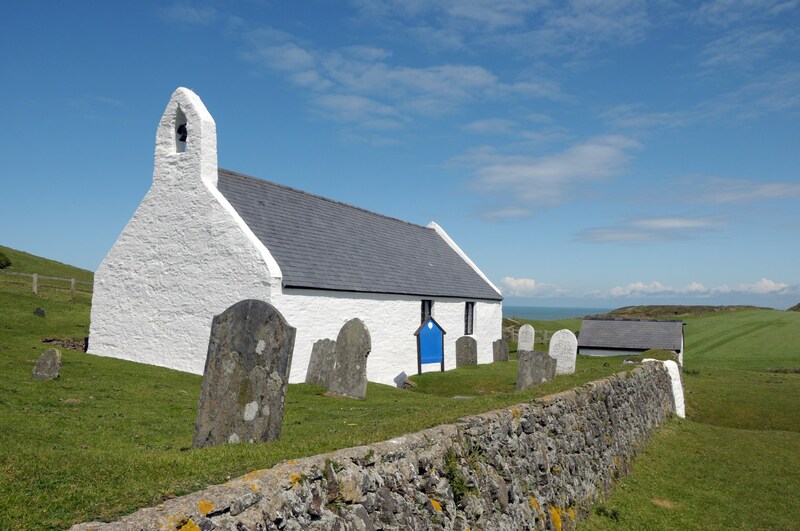 Close to an old limekiln, on the plateau below the peak, sits the isolated but much photographed Mwnt Church, a tiny building with thick and buttressed walls designed to stand strong against the winds and built as a chapel of ease for sailors and pilgrims. The church dates to the 14th century although this has been a religious site since at least the 6th century. Inside you can see the 12th century Preseli Stone and on the other side of the car park is the Holy Cross Well. Looking down from the heavens is the peak and you must now climb the “Foel” – there are plenty of paths up its perfect cone shaped flanks. At the top you walk along a narrow ridge, which adds to the excitement. Enjoy a sense of achievement and superb views over Cardigan Island, the little chapel now in miniature below you. The final leg towards the Teifi estuary continues with exhilarating climbs in and out of little valleys, but it’s getting easier and easier as you approach Cardigan Island on the horizon. Tight v-shaped little hanging valleys at Pen Yr Hwbyn take you into a hidden chasm of golden yellow gorse and scrub. The cwms are welcome breaks, taking you into hidden secret valleys with little footbridges at their head, before climbing back to the edge of the cliffs. Watch for gannets diving for fish as you return to the coastline. The coastal section ends at Cardigan Island where the path turns abruptly inland. Cardigan Island itself is now managed by the Wales Wildlife Trust and home to a colony of grey seals and a wide variety of birdlife. The puffins sadly are no more after rats that escaped from a shipwreck made it to the island and wiped out the birds. Originally named Hastiholm or Horse Island by the Vikings, it’s now a dedicated Special Site of Scientific Interest (SSSI), kept a rich green by the grazing of rare Soay sheep, and if you pass in spring it’s ablaze with carpets of bluebells. The path swings across fields into the Teifi estuary, arriving at the hamlet of Gwbert, where you can get refreshments from a couple of hotels that look across the estuary into Pembrokeshire and the mighty hump of Cermaes Head, the highest point on the Pembrokeshire Coast Path and a day’s walk away. 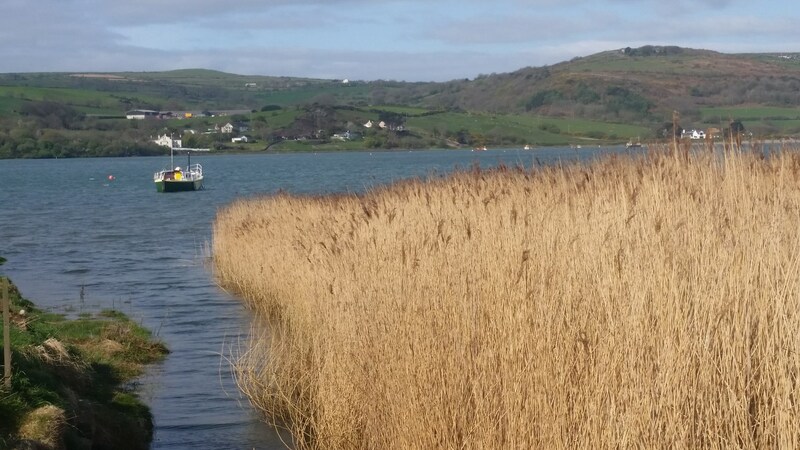 It’s easy walking now, with the snaking estuary on your right and the sea behind you, as you walk around the tidal sand bar and dunes at Pen yr Ergyd. There are good spots to see birdlife, attracted by the rich salt marsh - look for redshanks, oystercatchers, kingfishers, herons and cormorants – as you head up the sheltered estuary for Cardigan. The route takes gentle paths through meadows and woodland as it tracks the Teifi, with extensive views across its waters, firstly to golden Poppit Sands and then the little abbey village of St Dogmaels. Enter Cardigan along its historic waterfront, with intriguing floating restaurants converted from old boats – it’s a satisfying entrance to the town, at the southern boundary of Ceredigion. 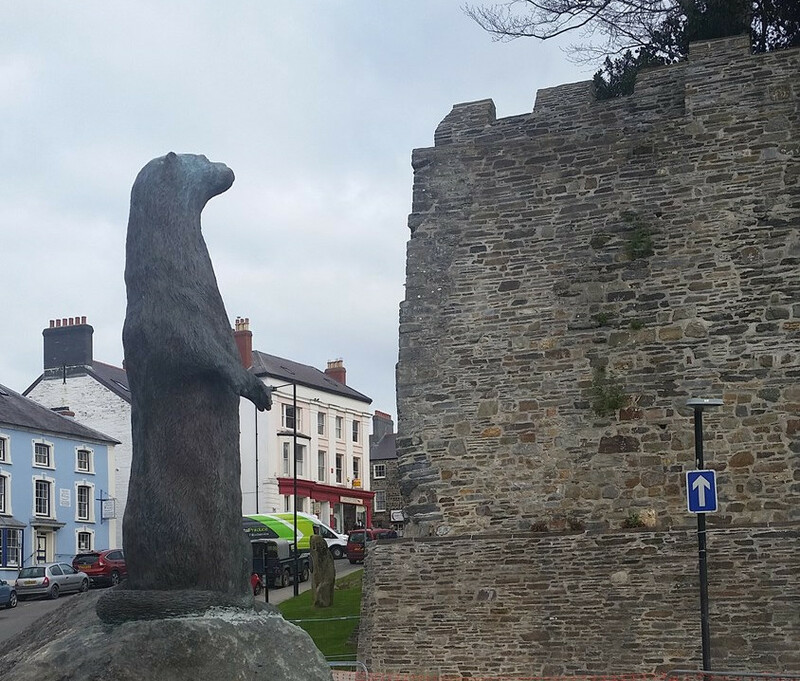 When you reach the waterside Quay and Heritage Centre you will find the official marker for the end of the Ceredigion Coast Path where the bronze Teifi Otter statue is a reminder of its cousins, who reside happily here in the upper Teifi Estuary. The huge walls of Cardigan Castle loom over as a backdrop; it is open to visitors if you want to look around. Those keen to continue their walk into Pembrokeshire can continue for 2 miles on the Wales Coast Path through gentle fields on the southern bank of the Teifi and overnight in St Dogmaels, where you can see the ruins of the impressive St Dogmaels Abbey, founded in 1115 for the Monks of the Tironian order. There you will find the official start of the next walking section – the 186-mile Pembrokeshire Coast Path – but then that’s another story entirely! Click Here for information on staying in St Dogmaels at the start of the Pembrokeshire Coast Path. Who we are, what we do and how to get hold of us ! The legal bits with language as plain and simple as we can do it!